MVC Web applications offer a clean separation of concerns between the business-logic classes, web pages, and the controller. Microsoft ASP.Net MVC offers web developers all the benefits of MVC combined with the full power of the .Net platform. 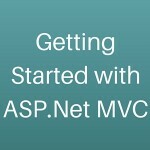 This course provides full coverage of ASP.Net MVC, including the new web API and mobile UI API. Anyone who wants to expand their skills and learn how to use the powerful MVC architecture. The course is also beneficial to those preparing for Microsoft’s developer exams.